A Beginner’s Guide to War Thunder – Researching New Aircraft | Killed in a Smiling Accident. More otters than you can possibly imagine. After each battle you are awarded with Research Points (RP), and what do Research Points make? Research Prizes! RP contribute towards unlocking modifications for the planes you were flying (covered in a separate guide), and researching new aircraft. Aircraft are divided into five ranks or eras, broadly chronologically but with some adjustments to account for performance in a game context, for example the German Do 217 J series heavy fighters in Rank II are derived from the Do 217 E bomber in Rank III. Aircraft you own have a blue background, aircraft you can research have a slightly darker blue background, aircraft that aren’t available for research yet have a red background. Over on the right hand side of the tree are Premium and Gift aircraft, with a yellow/gold background. Premium aircraft are bought with Gold Eagles (the real money currency), and don’t need to be researched; Gift aircraft are generally available in bundles, or sometimes in promotions or giveaways. To progress through the ranks you need to unlock a certain number of aircraft, shown under the Roman numeral on the left; in the screenshot I’ve got three Rank I aircraft and need six in total before I can research a Rank II aircraft, then I’ll need to research four of Rank II before I can start on Rank III. To unlock a specific plane you’ll need to have researched the previous plane in its line (connected via an arrow). 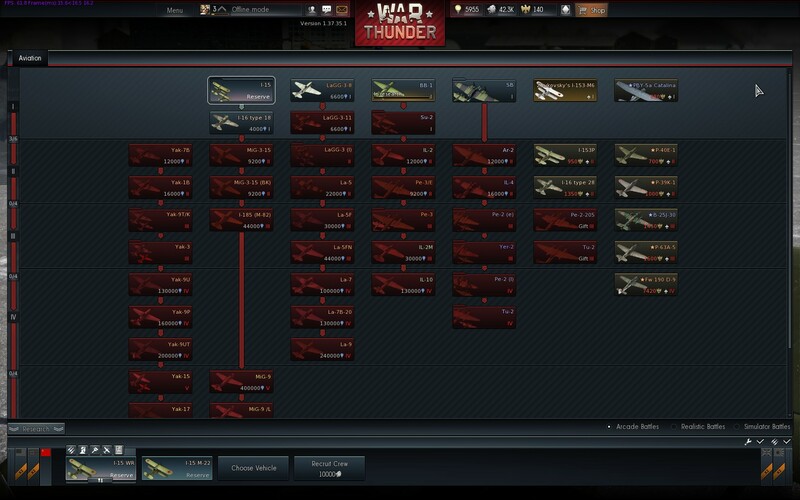 Some aircraft, such as the I-15, SB and Su-2, have a little tab in the top left corner of their icon; these are stacks of planes, if you click one then a window should pop up with two or more variants of that plane. Stacking can be a little inconsistent; the LaGG-3-8 and LaGG-3-11 aren’t stacked, despite being very similar, whereas the LaGG-3-35 and LaGG-3-66 after them have more significant differences, but are stacked. You only have to research one of a stack of planes to move down the line, so to get to the La-5 you have to research the LaGG-3-8, then the LaGG-3-11, then the LaGG-3-35, but you can skip the LaGG-3-66 (or you can research it as well, if three LaGG-3 variants just aren’t enough). The precise figures may not be completely accurate, and will vary depending on upgrades, but it should give a rough idea of the performance and armament. To get a first-hand impression you can also take any plane eligible for research for a test flight, either right-click or use the second little icon over the plane. The second stat on the card, “Battle Rating” (1.7 in this example), is a more granular indication of plane performance within Ranks, and very important for matchmaking. Battle Rating increases in rounded 0.33 increments (1.0, 1.3, 1.7, 2.0, 2.3 etc. ), and in general you should meet opponents with Battle Ratings up to 1.0 higher or lower than your highest BR. To research an aircraft, simply click the “Research” button just underneath it. You can research one aircraft per country at any time; the trickiest bit can be deciding what to choose next. For a new USSR player looking for a fighter there’s either the I-16 Type 18, the LaGG-3-8 or, if you click on the I-15, then the next option in that stack is the I-15bis. Of those, the LaGG-3-8 is quite a step up, a monoplane considerably faster than the other choices, and armed with a 20mm cannon, whereas the I-15bis is a slightly upgraded version of the starting biplane, reflected in their Battle Ratings of 2.0 and 1.3 respectively. For a brand new player, I’d actually suggest starting with the I-15bis; as mentioned the matchmaker works on Battle Rating, so if you fly the LaGG then you’ll meet tougher opponents. In this example I’m researching the I-153 M-62 and gained 1064 Vehicle research points in the battle, almost half the 2400 I’ll need to unlock it, represented by the yellow bar. Another battle or two should be enough to finish the research, especially if the team wins (victories grant a hefty RP bonus). Once unlocked, you need to buy the new plane with silver lions (the “Research” button under the plane turns into a “Buy” button), and then put it into service. You can replace one of your existing planes, but if you have enough money I would buy a new crew slot by clicking the “Recruit Crew” button at the bottom of the screen; the fourth slot costs 10,000 silver lions and the fifth slot costs 50,000 lions. You can buy further crew slots with gold eagles if you want, but five planes should last through most battles unless you’re particularly bold and/or unlucky. Either way you’ll need to pay to train the crew with the new plane; upgrading can be an expensive business! 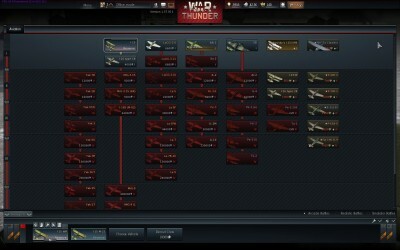 Click the “Research” button again to select the next aircraft you’d like to unlock; to focus on fighters, I’d suggest a new USSR player gets the I-15bis, the I-153 M-62, then the I-16, LaGG-3-8 and LaGG-3-11. For ground attack the BB-1 and Su-2 series have a useful combination of guns and bombs, and lead to the Il-2 Sturmovik; for heavier bombing there’s the SB series. If you’re not sure, or like a bit of a mix, then research one of each! This was really helpful! I’m a new War Thunder-er and I had no idea how to get new planes. Thanks! I am trying to reasearch the PBY but there is nothing before it. Once I hit the reaserch button, what plane do I fly? You can fly anything in Tier I or II to research the PBY, there’s nothing with a particular bonus towards it. hey, do you think you could update this guide? I think it’s still generally accurate, isn’t it? Though the interface colours have changed a bit since the screenshots were taken… If anything is out of date or unclear, if you could point out the specific bit I’ll try and give it a tweak, ta. 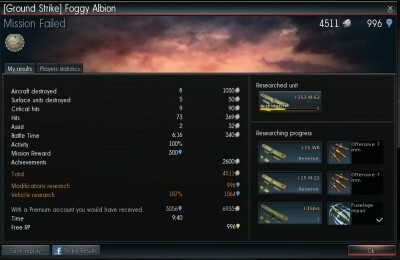 Ah, yes; you can use Gold Eagles to convert that into ‘proper’ RP, to actually research new planes with. It used to be called ‘free’ RP, but what with Gold Eagles costing real money that wasn’t the best description! 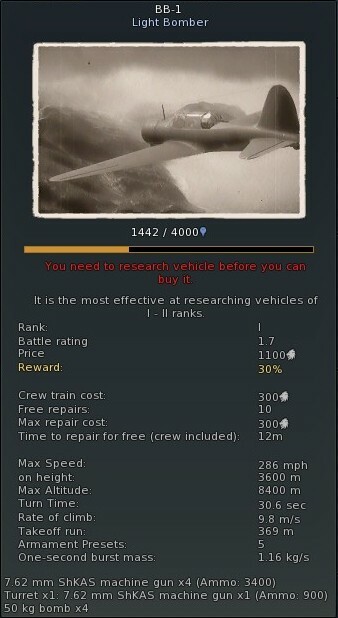 If you click the yellow lightbulb at the top of the screen you should get the “Accelerated Research” window for the plane or tank you’re currently researching, and you can adjust the slider to spend Eagles to convert RP. It’s not a bad way of using some of the Eagles you get from tutorials to finish off some early research when you really want a new plane, but it gets pretty expensive later on so I wouldn’t worry too much, unless you have plenty of spare cash. Hello there! 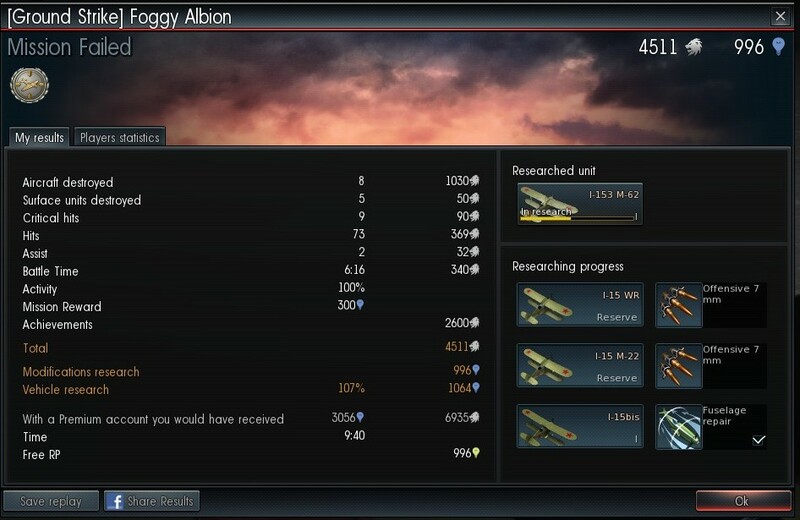 Research points always go towards the same country and type of vehicle (air or ground) that you play, so if you fly British aircraft, you work towards unlocking another British aircraft, or if you drive US tanks you work towards unlocking another US tank. I legitmately cannot find where the Research points are on the game. Can anyone point it out on the main menu? Regular research points are earned after a battle, and go towards the plane or tank you’ve selected to research. If you open up the Research window (as in the first screenshot here), the vehicle you’re researching has a bar underneath showing research progress, you can hover over it to show the details (the second screenshot shows the BB-1 with 1442 Research Points out of the 4080 needed to unlock it). You also get convertible research points that you can convert into regular research points using Gold Eagles, the total of these is shown at the top of the screen next to the yellow light bulb icon. Anyway~! As the game currently is with the British tank line being implemented in chunks, will the RP accumulate with an unspecified vehicle and then I’ll be able to use said points when the tanks are released? Or will the points just be converted into “free RP”? I’m afraid the extra points just accumulate as convertible RP rather than building up for the other tanks once they’re available. I’m a newbie. Mistakingly, I put a german panther (5.7) into research. I am fighting with level 1 tanks. How do I remove the panther and choose something at level 2? Just click the icon below the Panther (with two arrow icons), and you should be able to replace it with a lower level tank; if you haven’t got anything suitable then use the “Send on holiday” option to leave the slot empty until you finish research on something else. Just pick the aircraft you want to research if there’s nothing before it in the tree, there’s no special requirements, you’ll research it with whatever you fly. Great guide. Already knew most (if not all) of it, been playing over a year, with some brakes inbetween. I still have a doubt, though. About those stacked planes. It appears the last one in the stack has no extra Research Bonus to the next plane in the line. For example, in the German tech tree, if I fly a Bf 109 E-4 will I get the same bonus to research the F-1 that I would get from flying the E-1? Thank you for the writing this piece, you’re very articulate and you communicate well. Out of interest what if I was only interested in researching the British (heavy) bomber line ONLY. As the line British bomber line progresses, what happens regarding my reserve aircrafts as I progress in research of the one line? Do I have to research reserve aircraft? I’m afraid you probably won’t be able to stick to heavy bombers only; you need to research 4-6 aircraft at each Rank (the roman numeral on the left of the research screen) before you unlock the next one so you’ll have to branch out a little bit.